The next morning we woke to the weather for which we had packed. It was grey and chilly, with occasional drizzle. We reasoned that a rainy day was as good a day as any to see the more famous waterfalls on Iceland’s South Coast. Armed with homemade sandwiches and a great night’s sleep, we journeyed toward Geysir – the original hot water eruption from which all other geysers take their name (the English word Geyser is derived from Icelandic Geysir). On the way, we made a pit stop for coffee at the picturesque lakeside Spa Laugarvatn Fontana whose hot springs have been open to the public since 1929. We flirted with the idea of taking a dip but opted to press on with our original itinerary instead. Learning from the previous day’s mistake, we made sure to sample local cakes with our coffee before getting back on the road. 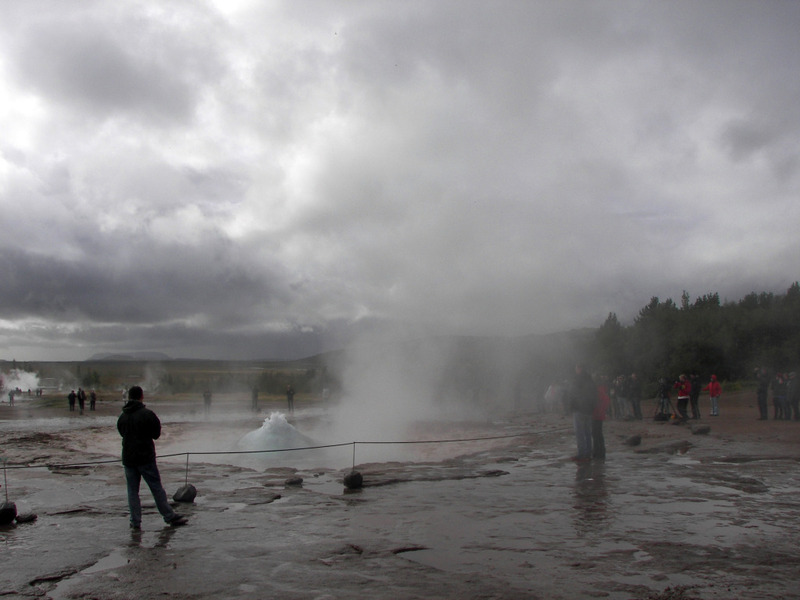 The most people we had seen since arriving in Iceland were climbing off buses en masse when we pulled into the parking lot of the Hotel Geysir (home to the Geysir museum, hotel and gift shop). 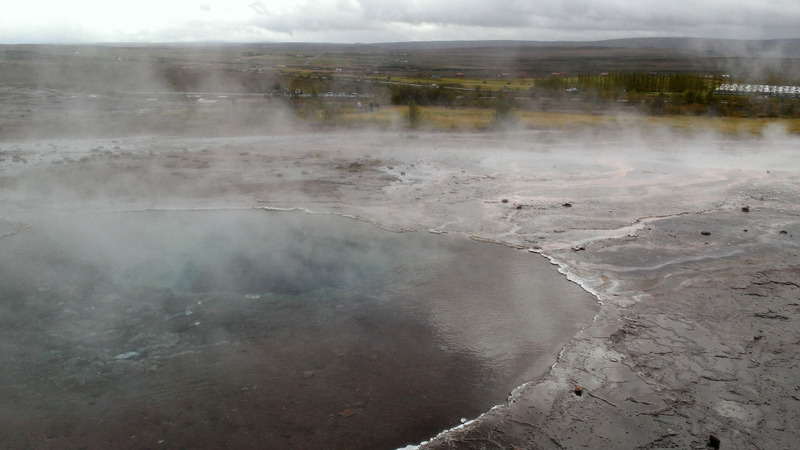 The original Geysir suffered an internal collapse and now rarely erupts. Staring into its steaming turquoise cavern of water that looks to be on the brink of a low boil is impressive nonetheless. The nearby Strokkur shoots water nearly 90′ (30m) into the air every few minutes and is enough of a spectacle for most. With constant and unpredictable shifting winds, almost no side of Strokkur is safe to stand on if staying dry is your goal. Anticipation mounts until the moment you watch a puddle quickly disappear into the ground before spewing high into the air. Smaller pools of boiling water abound in the surrounding area. It seemed only appropriate that the first souvenir from this adventure would be a Geysir brand wool blanket with a traditional Icelandic pattern from the gift shop across the street. 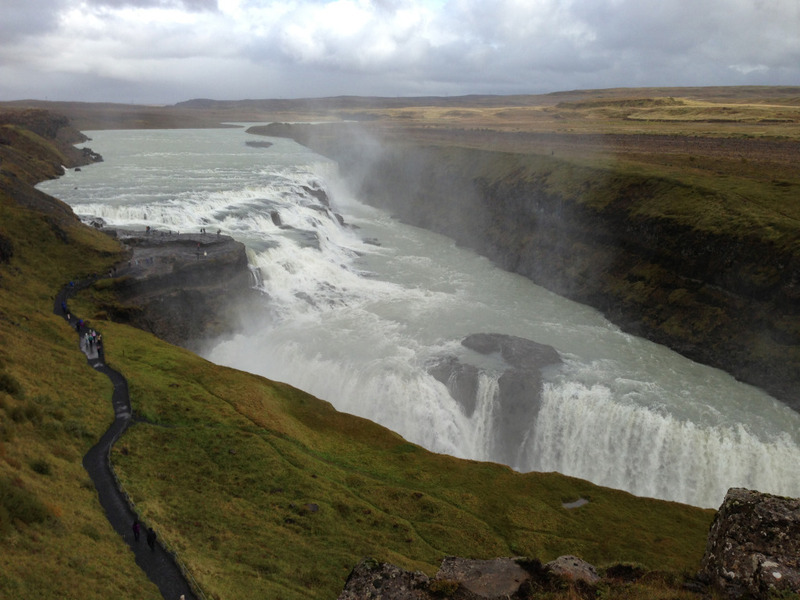 The next water feature on our list was Gullfoss, perhaps the most well known waterfall in Iceland. We raced to get there before the fleet of tour buses that were leaving Geysir, only to discover there was no need to rush. The falls were so massive it would have taken ten times the number of spectators for it to feel crowded. Upon reaching the viewing area for the falls, I was overwhelmed. It was like staring into Niagara Falls from a vantage far closer and less obstructed than you ever could today. Photographers were ambling over giant rocks to get the best shots and even the oldest of visitors were testing their stamina to climb up wet stone for a more remarkable vantage. This occurred despite a cold, hard rain that suddenly appeared. We had to turn south and head for the coast to join back up with Route 1 to get to Seljalandsfoss, the waterfall you can walk behind. About ten minutes into the drive, we encountered something we didn’t think existed in Iceland. Turns out, both guesses were half right. Just as we debated the merits of getting out of the car to find out what was going on, we were surrounded by sheep. Literally. Then a man on a horse went galloping by and we saw a boy to the side of the car flapping his arms…at a sheep. In most of rural Iceland, the sheep are free to roam into the hills to graze during the spring and summer. Before winter sets in, everyone gets together and goes up into the mountains to herd them all back to the safety of barns below. Once at sea level, they’re sorted and returned to their rightful owners. The Icelandic word for this sheep roundup is réttir. And it was totally serendipitous that we had stumbled into the midst of it. The sheep were gone as quickly as they had appeared. About 15 miles (25km) after turning onto Route 1 again, we spotted a small restaurant that was part of a campground overlooking the Ranga river. During that awkward period after lunch but before dinner, we were the only patrons in Restaurant Arhus. One of the specialties for which they are known is horse tenderloin. Having never had occasion to (or interest in) eating horse meat, I had to try it. Though I was a little apprehensive with the first bit, it turned out to be tender and delicious. We made it to Seljalandsfoss and walked behind the waterfall. Local lore holds that it’s the only place where a woman can propose marriage to a man. We were both in the clear. Again as we pulled away, we raced the tour buses to get to Skogafoss. This was when we realized that we had not paid any attention to the time whatsoever. It was broaching 4pm (1600), which meant two things: darkness was about 2 hours away, and our next stop, the Eyjafjallajökull Erupts Visitor’s Center would be closing in one hour. Though it may sound unfamiliar, you’ve heard of the volcano Eyjafjallajökull (Eyja for short). Its eruption in 2012 sent a plume of ash skyward that drifted across most of Europe. Millions of flyers were grounded and flights were disrupted for months. What few realize is that some volcanoes are ice capped. That ice cap is called a glacier by locals. When the volcano erupts, the glacier instantly melts and sends a river of slushy ash, tar and rock down the mountainside. The museum was a small outbuilding directly across from a family farm that took a direct hit from the volcano’s ashy sludge as it blazed a path of destruction that washed out roads, houses, and trees. We arrived at 430, just in time to see the last showing of the documentary about the farm, the eruption, and the aftermath. It was moving, and the parallels between the eruption and Hurricane Katrina’s devastation in New Orleans made it feel familiar. There are two silver linings to what could have been a serious tragedy. First, since Icelandic folks are so in tune with nature, they had a pretty good sense Eyja was about to blow. Many of those living in its shadow had already evacuated. Those who stayed behind had bags packed and at the ready for weeks. Second is that the volcano blew its top, but most of the mess went skyward in the form of ash and rock blown from the mountain. There was little damage from actual lava flow. I bought a tiny jar of ash from the eruption which now sits on my desk at work. One thing that surprised me was that it is closer to sand than cigarette ash as I had imagined. Cautionary note: black sand in a small glass jar in a carry-on bag all but guarantees you a secondary TSA screening. It wasn’t until the second airport checkpoint on the journey home that I thought to ask why I kept getting pulled aside. There was a spot a little off the beaten path not far from the museum called Seljavallalaug. Tucked in a small valley between two mountains, someone had created a small, hot spring fed cement swimming pool. We drove down a gravel path until it was clear that we could drive no further. As we wondered if we were in the right place, we saw another car pull up and a young couple emerged. Walking into the mountain towards where we were confident the pool existed, we marveled at the density, size and shape of all the lava rocks in a small stream. We finally did something we had been dying to do since we got to Iceland: we stooped down, put our lips directly in the water, and drank. No dysentery, no odd taste, just pure, clean water, straight from a mountaintop glacier. It remains one of my favorite moments from this trip. The pool itself was neat, but had been cooled a bit too much by the day’s rain. In our haste to get on the road that morning, we had forgotten to bring towels. We debated whether or not to strip down and jump in. My second regret from the trip was that we ultimately decided against a wet hour-long drive back to the city. 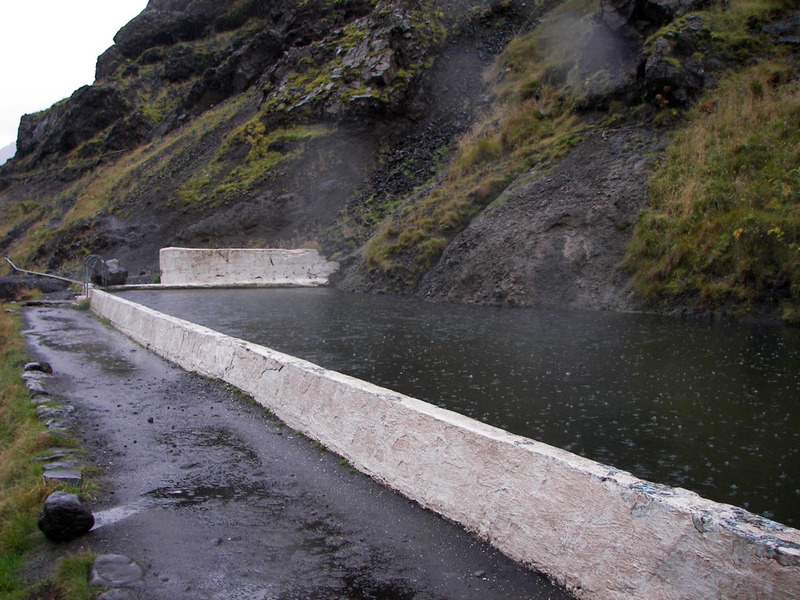 We drove back to Reykjavik through torrential rain which stopped only minutes before we reached the city. Suddenly the weather calmed and the night was quiet. We dressed up for dinner at a restaurant called Vid Tjornina. The restaurant is designed to look and feel like your grandmother’s cozy house in the 1940s. The dishes don’t match, knickknacks abound, and there are lace doilies everywhere. While we had neglected to make reservations, they were exceptionally accommodating. We sat in a parlor and enjoyed a bottle of champagne while they readied a table for us. Here we marveled at the cost of importing everything to an island nation in the middle of the ocean. Ernest & Jullio Gallo wine, $8 at any corner store in America, was $50 a bottle. I cannot recall exactly what I had to eat because the meal was overshadowed by the second bit of serendipity that followed. It was an event so strange that it easily catapulted this onto the list of my most memorable dining experiences of all time. We capped off the meal by ordering two cups of espresso. Unsurprisingly, when they arrived, the cups did not match each other. When I stared down at my saucer, I noticed something incredible. 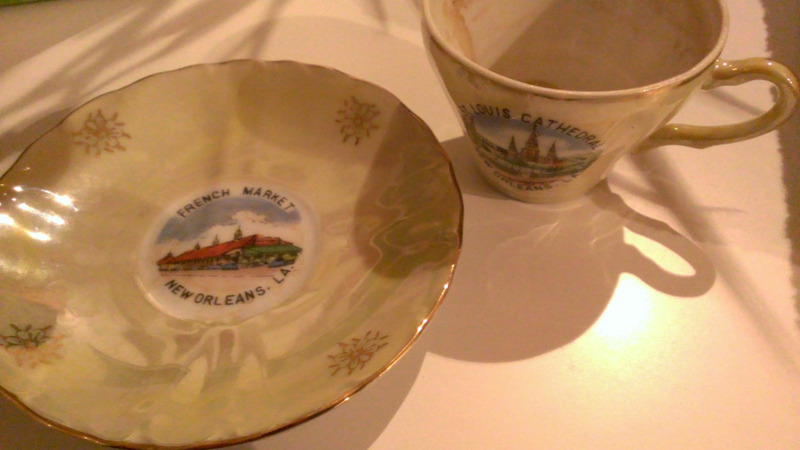 It was an antique espresso cup and saucer set, unlike any I have ever seen, depicting scenes from… *pause for dramatic effect* New Orleans. We shared the tale with the restaurant’s owner. He was not quite as tickled by the coincidence as we were. He explained that his mother picked up most of the dishes and décor from assorted yard sales or flea markets. That night, we went to a nightclub which started out looking like a sleepy café. A few tables filled a fairly small second story room and we made small talk with a few other tourists. As suddenly as the sheep had appeared earlier, a small army of staff appeared and asked us to stand so they could take away the tables and chairs. Within minutes, the small space was a crowded nightclub in full swing. We became intimately acquainted with the signature Icelandic liquor Brenevin – a clear schnapps that tastes of caraway and other herbs.